My pets make me very happy. I love blogging about pets not only because I get to share our stories and photos with you all, but because I interact with other people who love their pets on a daily basis. It would be an understatement to say that seeing photos of our friends' pets online everyday also makes me very happy. 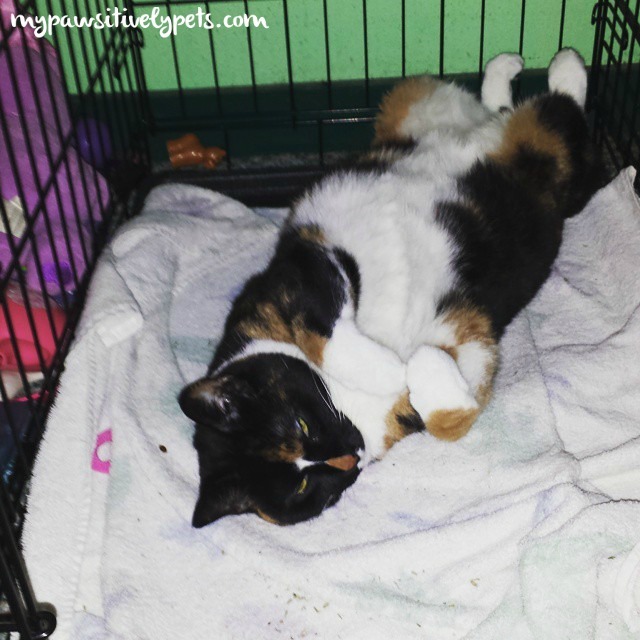 I was invited by a few other bloggers to share 8 photos of happiness here at Pawsitively Pets. Thank you to blogging pals Oz the Terrier, It's Dog or Nothing, AND Dolly the Doxie for inviting us to join in. It's very difficult to chose only 8 photos of happiness to share here, because I have probably thousands of photos by now. But, here are a few of my favorites. Every time I walk into the living room and catch Callie lounging with her belly up, it puts a smile on my face. She's a silly kitty and she just looks so cute laying like this. This Summer, we have visited the lake a lot. 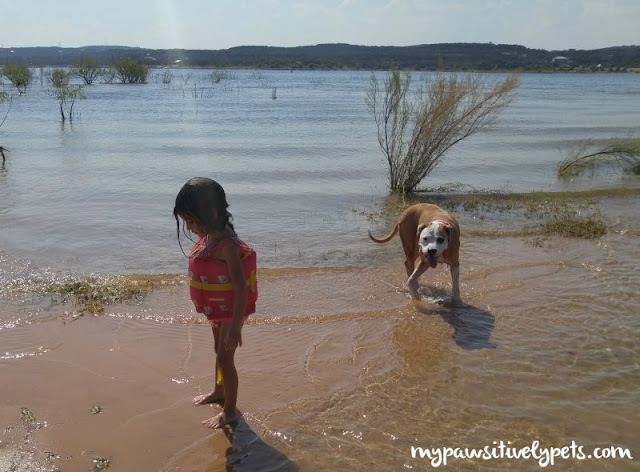 We bring Shiner with us most of the time, and it makes me very happy to see that she is having a good time. She follows us around everywhere, swims, and goes for boat rides. On Tuesday, she even chased a herd of deer. 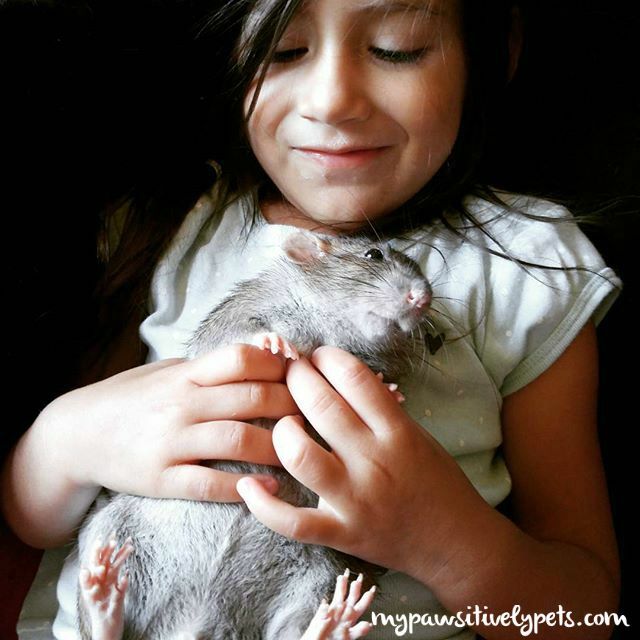 I love looking at pictures of my first pet rat, Nibblet. This is one of my favorites because it looks like she is smiling and she is just laying on top of me for scratches. 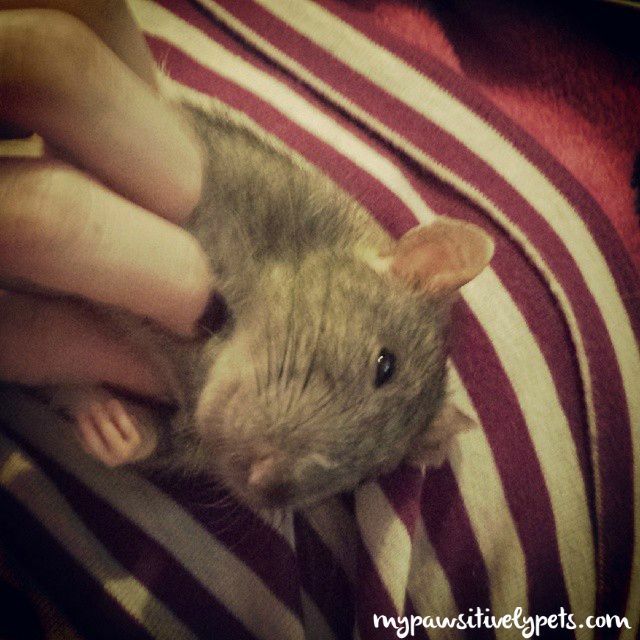 She was a very sweet rat, and I think about her all the time. I love this picture of Shiner. It's just a really good picture and it makes me happy! 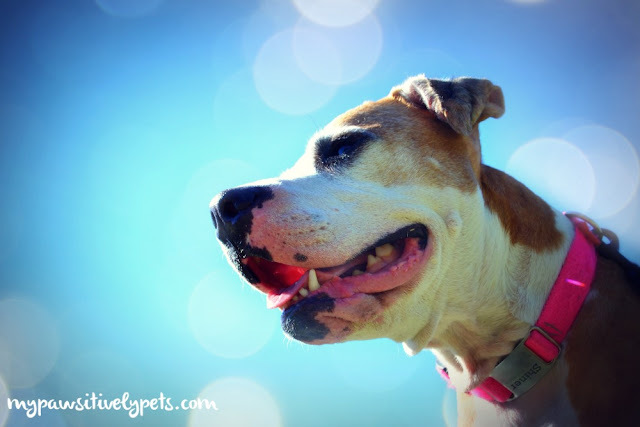 A beautiful blue sky and a happy dog are sure to put a smile on anyone's face. 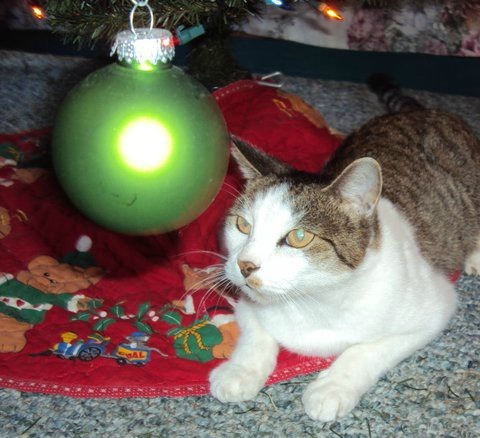 This is a picture of my old cat, Kitty Kitty Meow Meow, at Christmas time. KKMM loved Christmas. She was a good helper at wrapping present and liked to sit underneath the Christmas tree. Christmas and cats both make me happy on their own, but when combined the happiness effect doubles! While I am of course sad that my mother passed away this year, this photo of her and my daughter makes me very happy. 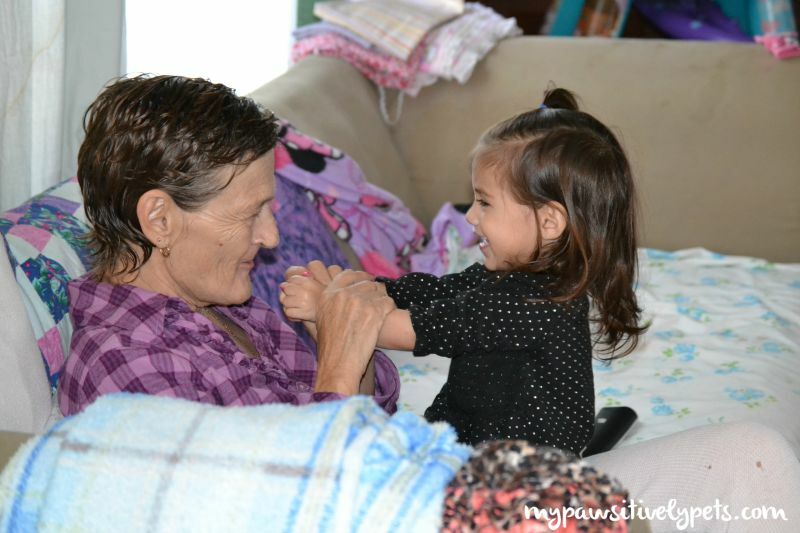 It shows how much fun my kids had with her and what a great grandma she was. This picture was taken a few months after her breast cancer diagnosis. When I found this photo, I asked my 3 year old if she knew who that was and she said "Grandma". I am glad that she still remembers her and that I have something to help her remember when she grows older. And finally, my oldest daughter makes me happy because she is an excellent big sister. A few weeks ago, we were at a birthday party with a trampoline. Violet's hair got caught in something and I was trying to get it out, but kids kept jumping despite me asking them not to for a few seconds while I retrieved the hair. 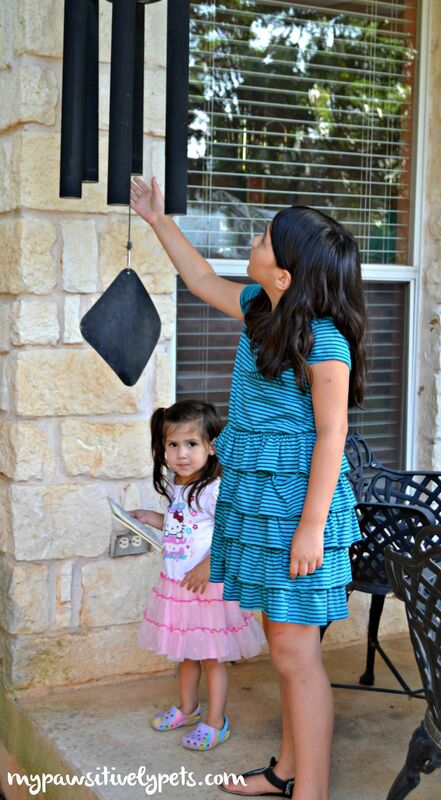 Big sister Lily stepped in and demanded those other kids stop jumping because her sister needed help. That just made my day. Hopefully, these photos have made your day a little brighter! This was a fun post and I enjoyed sharing them with you. That was a nice big bunch of happy!!! We posted our happy too! Woohoo! Going to go check it out. I love your happy photos, very nice choices. I am sorry about your mother's passing. Loved seeing your photos! That one of Shiner is a great shot! I do like that one... it's an interesting picture unlike any others I have. Thank you! Awww wow, these are amazing photos! I loved all of these so much that I am hard pressed to pick a favorite. I am so happy that Callie settled in so well! Sleeping "belly up" is a sign of relaxation and complete trust (as I KNOW that you know!!). That makes me happy. Yes, Jack is smiling in that photo with your daughter, it is adorable. I love the last photo too of both of your girls.........they are beautiful, inside AND out. And of course your Mom.........Shiner.......told you...ALL of these photos are just fabulous! Thanks Caren :) Callie has definitely settled in nicely. Although her and Shiner are still working things out, everything is going purrfectly. Beautiful photos. Your life is filled with happy times. Yay! Thank you for sharing the link - going to check it out now. Lots of good happiness there. I loved your happy photos!! The one of your mom and daughter made mum tear up a bit!! That is a lot of happiness! Those are definitely some happy pictures. Thanks for sharing. Seeing everyone’s photos sure makes me happy. These pictures all made me smile! Wonderful, joyful photos! Jack and your youngest daughter look so very sweet together. They both look blissed-out.